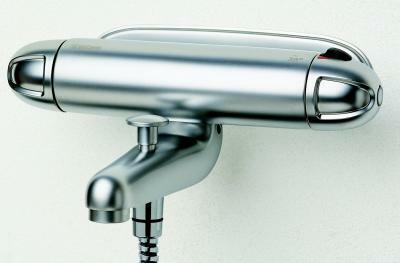 Thermostatic/Pressure Balancing Safety Shower with automatic shut-down. Model 9200 in Chrome. The 9205 wall mount system is peeking out from behind. Order Below. You may be asking yourself, what is the difference? There are a lot of "temperature control" shower valves on the market! The answer is that the FM Mattsson shower is different because it is both thermostatic and pressure balanced. Safety tests dramatically prove that only a valve that is both pressure balanced and thermostatic can solve the problem of temperature fluctuations in a water system. In fact this patented system is so advanced, that it holds temperature fluctuations to ±2°F (±1°C) at the outlet. If any water system is not kept above 140°F (60°C) in tanks and 122°F (50°C) at all taps, the chance of dangerous bacteria such as Legionella (Legionnaires' Disease) increases significantly. The Problem: Water at 150°F will cause a third degree burn (full thickness burn requiring hospitalization and skin grafts) in just half a second. Children under 4, and the elderly are more at risk because their skin is thinner than that of older children and adults. The often touted solution of turning down the temperature in a hot water heater is not safe because water needs to be kept hot enough to kill the bacteria that builds up in any water system. Children under 4, the elderly and and the disabled may lack the ability to escape a life-threatening burn situation, and further may not be able to tolerate the physical stress of a post burn injury. Typically a young child in hot water will scream, but may not withdraw from the water. The Solution: No where else will you find this unique combination of features built into a shower. The breakthrough technology built into this valve provides the most advanced means available of avoiding scalding or thermal shock injury in the bath. At the same time it provides unparalleled luxury and comfort. This unique product was developed in Sweden. The building codes in Scandinavian countries are much stricter than in the U.S. The Swedish government legislated that a solution must be designed for the problem of scalding in hospitals and nursing homes, and the Thermostatic/Pressure Balancing valve with automatic shut-down was born. Before adding to cart, please choose any options you desire below each product in the scroll down list. Default if you do not select anything is no wall mount and no personal shower set. Option: 9205 Wall Mount System: Escutcheon plate + adapters that convert from 3/4 inch at back of unit to 1/2 inch piping. on 153mm centers. Use the scroll menu to choose. Option: 3420 White Personal Shower Set: Use the scroll menu to choose. Before adding to cart, please choose any options you desire below in the scroll down list. Default if you do not select anything is no wall mount and no shower set. Option: 9205 Wall Mounts. Escutcheon plate + adapters that convert from 3/4 inch at back of unit to 1/2 inch piping. Use the scroll menu to choose. Option: 3420 White Personal Shower Set. Use the scroll menu to choose. The Mattsson shower mixer was designed for installation and retrofitting onto most boats and ships. External mounting means that the mixer can be installed simply and easily. For installation through a bulkhead all that is required are two holes 6" apart. Two threaded mountings are installed into the holes and the mixer is merely attached to the 3/4" threads. The personal hand shower and its mount are quickly and easily installed and then attached to the 1/2" standard outlet on the mixer. In most cases, the complete installation can be accomplished in less than an hour! It's just that simple! Complete access to critical parts are the reason that Mattsson marine shower valves are designed to be fully exposed. In the unlikely event that a cartridge needs to be replaced, the entire valve mechanism is completely accessible. The owner can easily replace the cartridge using simple tools in just a matter of minutes. Economic repair kits containing everything you need to repair your faucet or shower are also available from Scanmix. Stowing a repair kit on board would allow repairs without interrupting an extended cruise. Join our growing list of customers who have discovered the superiority of a Thermostatic and Pressure balanced shower valve. Ship and yacht builder customers include the U.S. Coast Guard, Holland America Cruise Lines, Joiner Systems, V. Ships, Tribute Performance Boats, TDI Halter, Keystone Shipping, Sabre and Kadey Krogen Yachts. Why invest in a Water Conserving Faucet?